Virgo Hosting High quality, yet affordable cPanel Linux hosting! High quality, yet affordable cPanel Linux hosting! 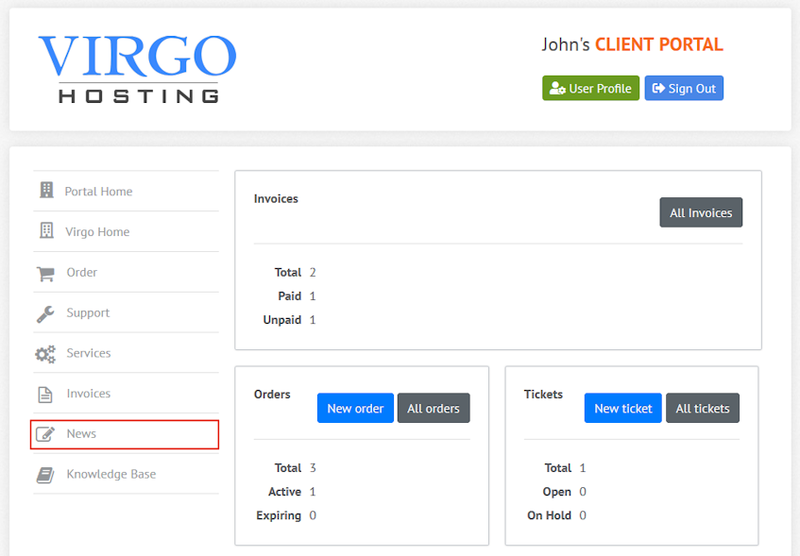 The News interface in the Virgo Hosting Client Portal lets you view news and announcements from Virgo. Please disable any ad blockers in your browser while accessing the client portal. We do not show you advertisements in any shape or form, but some functions of the client portal use pop-up forms which may get blocked by ad blocker applications. Login to your client portal using your web browser. Enter your email address and password in the appropriate textboxes. In the client portal homepage, click 'News' button in the menu. If you're accessing the client portal from a mobile device, the menu will be accessible through the 'MENU'icon. If you need more assistance with this subject, please contact Virgo Hosting Support by opening a support ticket. We'll be happy to help. Click "Support" link in the menu to access the "Support Tickets" interface. If you're accessing the client portal from a mobile device, the menu may be accessible by clicking the "MENU" icon depending on your screen resolution. Click "Submit New Ticket" button. Choose the help desk you'd like to send your support ticket to from the "Help Desk" dropdown menu. Enter the support ticket subject and your message in the appropriate text boxes. © 1997-2019 Virgo Internet Services Ltd.